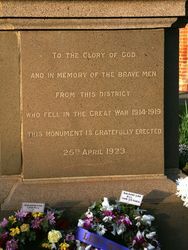 The Fallen Soldiers Memorial commemorates those who from the district who died in service or were killed in action during World War One. 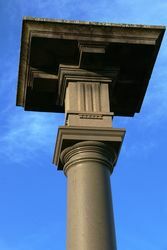 An eleven metre high column with platform made of polished Bowral trachyte. Dr. Earl Page assisted by Mr. Austin Chapman (Minister for Customs) and Mr. J. A. Perkins, M.L.A., unveiled a memorial to fallen soldiers from Queanbeyan district. The memorial consists of a polished trachyte column, 36ft. 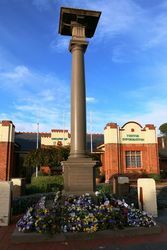 high, erected at the corner of Monaro and Lowe streets, at a cost of £1000. Dr. Page complimented the honorary architects, Messrs. John Reid and Son, Sydney, on the beauty of the design. Mr. Chapman made an appeal for funds to clear the committee of debt, and the necessary balance was subscribed. A number of beautiful wreaths was laid on the monument by relatives of the 51 fallen soldiers whose names are inscribed on the base of the column. Goulburn Evening Penny Post (NSW), 20 December 1923. This monument was unveiled by the Hon. Dr Earle Page, Acting Prime Minister of the Commonwealth of Australia. Assisted by the Hon. E. K. Bowden, Minister for Defence and the Hon. Austin Chapman, Minister for Customs.